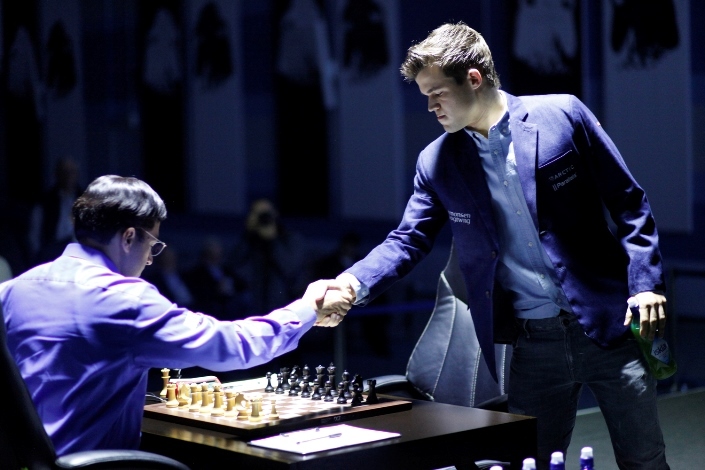 Magnus Carlsen is one win away from retaining the World Championship title, but by reaching Game 11 Vishy Anand has already exceeded the pre-match expectations both of many experts and statistics – whatever happens now the Indian challenger will have increased his rating during the match. Vlad Tkachiev asks himself what Vishy is planning, drawing parallels with a Jack London short story about a veteran boxer taking on an opponent half his age. Is Anand even planning a comeback? Where’s the aggression that would require? Why do the queens leave the board at the first opportunity? Is it more important for him to regain the title or to show the whole world that he’s capable of competing almost on a level footing with Carlsen? Trying to fathom what’s going on, I was reminded of the Jack London short story, “A Piece of Steak”. If you recall, that story is about a 40-year-old boxer called Tom King. A former champion, he now does odd jobs to make ends meet and before an upcoming match with a young opponent can’t even allow himself the piece of steak he needs to build up his energy. 20-year-old Sandel – the man he’s up against – immediately launches himself at the hero worn out by a long career. Things aren’t, however, so simple, and experience enables King not only to resist the blows of the youngster but also to land a heavy blow himself in Round 3. So the match develops as more or less one-way traffic, until in Round 10 Tom nearly knocks out his opponent. Alas, his energy is almost spent, and all that remains is to throw himself into a last desperate attack, which is what happens in Round 11. It seems he’s done everything right – Sandel falls to the floor after the veteran lands a series of powerful blows to his head, but then it all goes wrong – youth prevails, on the count of 9 the guy gets up, and… When he wakes up Tom realises he’s lost and trudges penniless home to his hungry family. Ah, if only he could have eaten a piece of steak – his decisive blow would have had the necessary power. Now King understands the inevitable fate of every declining champion. I think that story formulates the scenario Vishy would like to avoid. Resigning himself to the clinch in which the opponents have been locked for a few days now, Anand is counting on preserving his energy for the final 12th game, and that’s where he’s going to stake everything on red or black, or perhaps even white. What are the pros and cons of such an approach? The match is undoubtedly not going the way the Norwegian intended. Yes, the score still remains 2-1, but was that what they’d planned for before the struggle began? I’m sure it wasn’t. At the decisive moment experience may become the key factor – and that’s one area where it’s comical even to compare the background of the opponents. In the 12th game a half-correct opening variation stored up for just such an occasion may come into play. By that point exhaustion is unlikely to allow Magnus to find a difficult refutation at the board. Such a “soporific” strategy corresponds to the Indian’s mentality. You might not make it to the 12th game – Viswanathan’s play with Black in this match doesn’t inspire great optimism. So the decisive battle might take place not with the white but the black pieces. Which of the players is more tired is a big question. Magnus may have been forced to do an unusually large amount of work on the fly to shore up his black openings, but the difference in age is nevertheless 21 years. It’s all too predictable that Vishy is intending to fight the main battle in the final game. It’s absolutely obvious that Carlsen’s team will come up with some kind of unpleasant surprise for that situation. We’ve already seen what they’re capable of. Many were surprised by Magnus’ choice of the Grünfeld Defence at such an important moment, although it fits perfectly with the “butterfly” strategy he’s adopted, flitting from one opening to the next – and each time, unexpectedly. That was how Fischer neutralised Spassky’s coaching staff back in 1972, and how Korchnoi avoided Karpov’s novelties in Baguio in 1978. Taking a pit stop at the height of a World Championship match isn’t the most pleasant of activities, and sometimes you have to take a nap right during your drive – sorry, game – but so far the results have been wonderful. And in any case, the Norwegian team was left with no simple solution after the accident in Game 3. Nevertheless, I don’t think that in the final game – if things get that far – Carlsen will once more resort to the Grünfeld Defence. Each of the four last times he’s played it – against Ivanchuk and Grischuk in London in 2013, and against Anand in the 1st and 10th games – he was forced to solve extremely complex problems at the board. In my view it’s a classic example of incompatibility between an opening and a style of play and preparation. It’s another issue that the 11th game still awaits, and watching Anand play the Berlin Variation has been like following a tightrope walker. Perhaps Viswanathan will choose something else, something sharper? No, of course not. Relax, fans of the Sicilian Defence, and cross your fingers – we might get tiebreaks! Do you remember how the 2010 match in Sofia between Anand and Topalov went? Back then Veselin leveled the scores with four games to go and then, with the white pieces in the deciding 12th game, he committed ritual suicide. The reason was obvious – he wanted to avoid rapid tiebreaks at all costs. Two years later Boris Gelfand didn’t manage to avoid that fate – and ultimately lost. Previously it went without saying that Vishy would be the favourite in rapid chess – that was an ace up his sleeve. 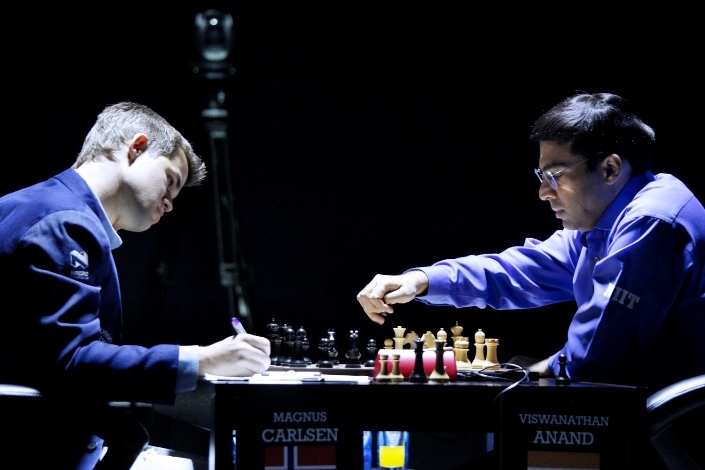 But that was previously, times have changed and the overall score of Anand against Carlsen in blitz, rapid and blindfold is 10-8 (not counting draws), and in the last 6 years Magnus is even leading +1. So if we do get tiebreaks the battle looks like being evenly balanced. By dragging the match out to a critical moment Anand has put himself in the position of someone trying to read tea leaves: red or black, 11 or 12? But after all, we might also get zero – tomorrow. 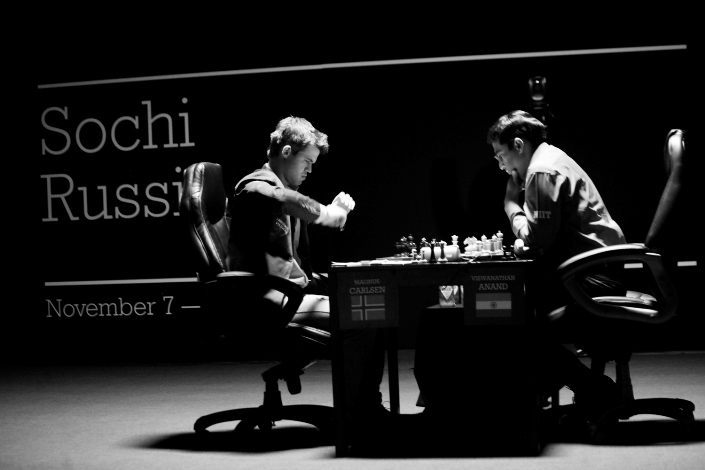 Today, 23 November 2014, is already the tomorrow of the article - with Game 11 of the 2014 World Chess Championship starting at 13:00 CET. Magnus Carlsen has the white pieces and if he wins will remain champion for at least another two years. Needless to say, don't miss the live coverage here on chess24!